SDL Auctions Cheshire and North Wales is presenting a hat trick of opportunities in its April auction at Chester Racecourse on Wednesday 25 April. 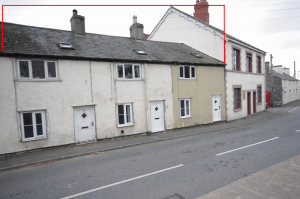 There is a unique opportunity to bid for a row of three mid terraced cottages at 4, 5 and 6 London Road in the village of Trelawnyd on the outskirts of Prestatyn town centre. All three houses are two storeys and have had replacement UPVC doubled glazing and first floor velux windows fitted. All three properties will go under the hammer as one lot with a *guide price of £125,000+. Anyone seeking a lovely quiet holiday or retirement home will be interested in Craig Y Brenin in Llanddona, Beaumaris, Anglesey, a charming two bedroomed detached bungalow tucked away at the head of a private driveway. Llanddona is a popular holiday destination and has a famous blue flag sandy beach. The property is situated between the larger towns of Beaumaris and Benllech and is only ten miles from Bangor. It has a guide price of £130,000-£140,000. Also for sale in the auction is the land next to Craig Y Brenin,, a neighbouring plot of land which has lapsed planning permission for the construction of a detached property and has a guide price of £40,000-£50,000. Those looking for something larger will be drawn to 34 Sea Road in Abergele, which is a substantial five/six bedroomed property situated in a convenient residential location within walking distance of the town centre and the sea front. It has a guide price of £90,000+. And for those looking for something a little easier on the pocket, land adjacent to the River Ouse in Naburn, York, is a 1.57 acre freehold vacant site on the banks of the River Ouse situated on the outskirts of Bishopsthorpe is offered with a guide price of just £1+. The land is accessed off the B1222 and is close to York Marina, York designer outlet and the A64. The SDL Auctions Cheshire and North Wales auction takes place at Chester Racecourse on Wednesday 25 April. The full catalogue featuring 20 lots can be viewed here.